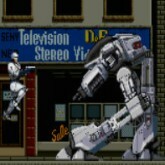 Description: A 2D run and gun beat em up game featuring Robocop, the 1980's kids hero lol. Back in the 80's this arcade game was on fire, the sound, the scenes punching then taking out Robocops gun on the fly was pretty cool. The sound, voices, enemies and music were all true to the movies.